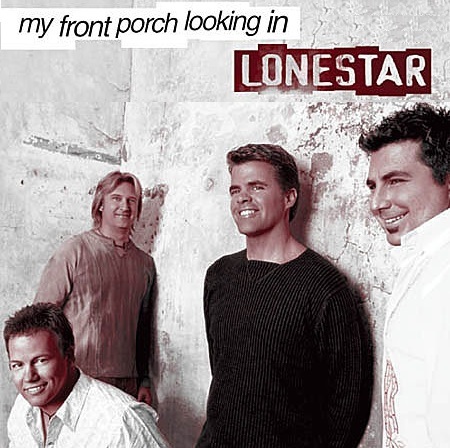 "My Front Porch Looking In" is the title of a song written by Richie McDonald, Frank J. Myers and Don Pfrimmer, and recorded by American country music group Lonestar. It was released in March 2003 as the first single from the band's album From There to Here: Greatest Hits. The song reached the top of the Billboard Hot Country Songs chart and peaked at number 23 on the Billboard Hot 100. From There to Here: Greatest Hits is the first greatest hits compilation released by American country music group Lonestar. In addition to chronicling the greatest hits from their first four studio albums, the album includes the newly recorded tracks "My Front Porch Looking In", "Walking in Memphis" (a cover of the Marc Cohn song) and "I Pray", as well as a second recording of their 2002 single "I'm Already There". "My Front Porch Looking In" and "Walking in Memphis" were both released as singles. Lonestar is an American country music group consisting of Richie McDonald (lead vocals), Michael Britt (lead guitar, background vocals), Keech Rainwater (drums) and Dean Sams (keyboards, backing vocals). Lonestar first charted on Hot Country Songs in late 1995. Nine of the band's singles have reached number 1 on this chart: "No News", "Come Cryin' to Me", "Amazed", "Smile", "What About Now", "Tell Her", "I'm Already There", "My Front Porch Looking In", and "Mr. Mom", with nine more reaching Top 10 on the same chart. "Amazed" also charted at number 1 on the Billboard Hot 100, becoming the first song to do so since "Islands in the Stream" in 1983; both "Amazed" and "My Front Porch Looking In" were the top country songs of 1999 and 2003, respectively, on Billboard Year-End. The group recorded seven albums an a greatest hits package for BNA Records, and an eighth album for Saguaro Road. Three of their albums have been certified gold, while three more have been certified platinum or higher.